Christmas is coming so it is time for the next annual episode from Peter Watt of his gripping Australian historical family saga/melodrama about the MacIntoshes and the Duffys. The main problem is that over the year I have forgotten so much about the many interesting characters that play a part in this long-running saga so it takes a time to remember them again, despite some pretty good back-story writing. While the war in Europe is over the war in the Pacific continues its bloody toll. Lieutenant Donald MacIntosh (a goodie) and Major David Duffy are battling the Japanese in the jungles of New Guinea. Captain James Duffy, a US Marines top fighter pilot has returned to the Pacific War and Sergeant Jessica Duffy has returned from a secret mission where she rescued a key US officer from the Japanese. Meanwhile, at home Sarah MacIntosh (a real baddie) is increasing her control over the MacIntosh businesses by foul means or fair (mainly very foul) and has taken advantage of war profits to increase the wealth and power of the businesses. Despite that, she never forgets her enemies and takes aim at Tom Duffy who at last, with her brother Donald's help, has at long last been able to purchase his ancestral property of Glen View. She also takes aim at anything that is precious to Donald. As always the mythical elderly Aboriginal warrior Wallarie still haunts the family members, protecting some and warning others of danger. "A long time ago a white fella called Donald MacIntosh had all of my mob killed. I survived - and now I am also gone. Sometimes I fly to the earth as a wedge-tailed eagle and soar above the lands I once hunted." This is a sweeping historical melodrama with so many characters and settings that it is sometimes hard to keep track of them. Peter Watt does a great job with these characters, especially the real baddies. He is also prepared to kill off characters who you are barracking to survive and prosper. I have read all of this long running series and still come back to it from year to year. I seriously recommend that interested readers should start with "Cry of the Curlew" to give you a background to the series. 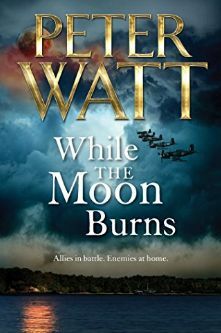 Watt has a great feel for Australian history in the late 19th and 20th Century. This book takes us from the Pacific War to peace and then back to war again in Korea. It finishes up at the start of the Malaysian communist uprising which I am sure will be the starting focus for next year's episode.